TRACE MODE® 6 consists of two parts, the Integrated development environment (IDE), and a set of runtimes. The IDE is installed on developer’s PC and is used to generate a set of files called the TRACE MODE project. The runtimes are used to run the TRACE MODE projects in real time. The TRACE MODE IDE allows to make simultaneously one project for many runtimes called project nodes. One project node can be run under one runtime. powerfull debuging and remote diagnostics tools. 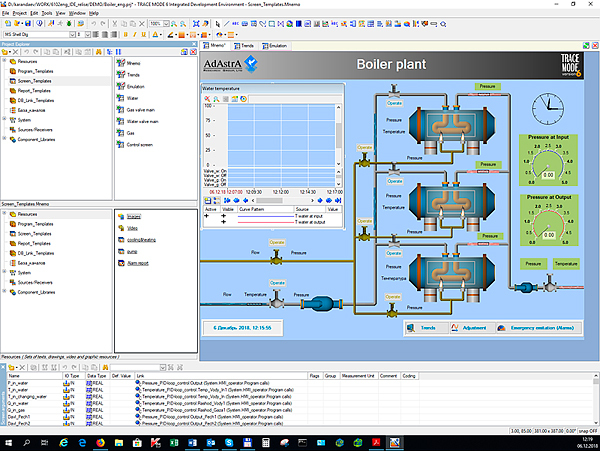 TRACE MODE SCADA/HMI can be used to build control systems of almost any architecture. The simplest control system that can be made with TRACE MODE is a single-node stand-alone workstation. Such systems are used everywhere and usually do not have a large number of controlled parameters. The minimum number of IO's for such control system is 15. OPC RTM+ (Real-time Monitor+ with historian and an OPC-server for communicating with other SCADA). TRACE MODE SCADA/HMI can be used in geographically distributed remote control systems. For this purpose, TRACE MODE contains technologies of data acquisition and control in unstable communication environment. In remote control systems at remote sites, it is necessary to use controllers with Micro TRACE MODE, and in the control room - any TRACE MODE RTM. The dispatcher's server can be made redundant. A client-server system described below can be set up also. automatic "recovery" and smooth data storage from remote sites during periods of non-communication. In central control centers, it is possible to build large, multi-node client-server systems with hot redundancy in the architectures described below. Client-server is the most common architecture for medium and large process control systems made in TRACE MODE. The advantages of this architecture are cost-effectiveness, ease of creation, operation and administration. Clients can be connected to the server either locally or remotely via the Internet. In this case, the communication channel is recommended to be encrypted using VPN. Any RTM is used as a server, and NetLink Light modules are used as clients. Distributed control system (DCS) is the most reliable architecture of the TRACE MODE-based control systems, in which the incoming information is repeatedly duplicated on each of the system nodes. Thus, the system keeps working up to the last PC shutdown. TRACE MODE-based DCSs are designed for highly reliable large control systems, where price does not matter much. As DCS nodes, any TRACE MODE RTM can be used. The web-architecture of the control system allows remote access to the technological process. However, despite the technical means of protection, it is generally unsafe to open access to the control system from the Net. Encrypted VPN networks or NetLink Light modules are recommended for reliable connections. Therefore, a web architecture, regardless of the manufacturer of the solution, is suitable for automating only low-value objects that are not safety critical. Cloud systems are primarily suitable for accounting systems. They allow you to receive remote access to data at the request of users without control functions. DocRTM+ is used as a server in cloud systems, and browsers on any platforms — on PCs, tablets, smartphones — are used as clients. DocRTM+ as server, and browsers on any platforms - on PCs, tablets, smartphones as clients. TRACE MODE SCADA supports many international communication standards, but unlike other SCADA systems, it also has its own communication protocols i-NET and M-Link, which allow to increase the security of communication and flexibly solve client tasks. TRACE MODE® 6 is handy and easy to use. However, the system architecture is designed for building the large corporate - scale information systems that can be used plantwide. Such freedom and power of development in is supported by TRACE MODE® high technologies, which boost up developers’ productivity.